The garage door opens and with a sporty exhaust sound, a Saab 9-5 NG Bio Power in Arctic White slowly slides into the open. Sporty sound in the four-cylinder? Yes sure ! Responsible is the sport exhaust system of Hirsch Performance, which chases us a comforting chill over the back. After writing about electric cars again and again in the last week, the petrolheads will be up for grabs in the next few days. Maybe not so hip, not so politically correct, but more fun. And in this article we burn a lot of Super Plus and E85. Achim and I are in guest in Saab center Kiel, and in front of us are 619 kilometers to the south. It is freezing in northern Germany on this day, the thermometer showed in the early morning on our arrival in Hamburg minus 12 degrees. But the freeways are snow-free and weakly frequented this Saturday, promising to be a swift and relaxed ride. Let's see what the Saab can do. It's my second encounter with a linear, which at first sounds unspectacular after abandonment. Linear Number One had been a very early, very poorly equipped, 9-5 TID model from the Saab Frankfurt inventory. With friend Marco and me he left an ambiguous impression. The processing showed room for improvement, the chassis without Drive Sense was insecure on bad roads. Now we are back in front of a Linear, one of the last to come off the line in Trollhättan in spring 2011. So far, the vehicle has been operating close to Gothenburg and is well equipped above average. Navigation, Harman Kardon sound system, color info display in the speedometer, the cargo system in the trunk and much more are on board. In Sweden, the low base price for business cars is taxed, and so linear models are often very well equipped with everything that made the price list possible. He has features on board, which would have had a German linear not as an order option, but again no Drive Sense, but only the normal sports suspension. Can he still like it? We will see ! In Kiel, the Saab was upgraded with the Hirsch sports exhaust and the Hirsch performance increase on 260 PS. The 9-5 is now doing with the soundscape in the warm-up on Turbo X. For the regularly reading visitors from Ingolstadt, Wolfsburg and Munich must be noted that it works without a sound generator. With the additional 40 horses and the gain of 50 Nm the 9-5 in performance corresponds approximately to the model year 2014, 250 PS and 400 Nm would have been standard in the series. The driving fun is thus nothing in the way. With a tank full of ethanol we leave Kiel, heading for Hamburg. 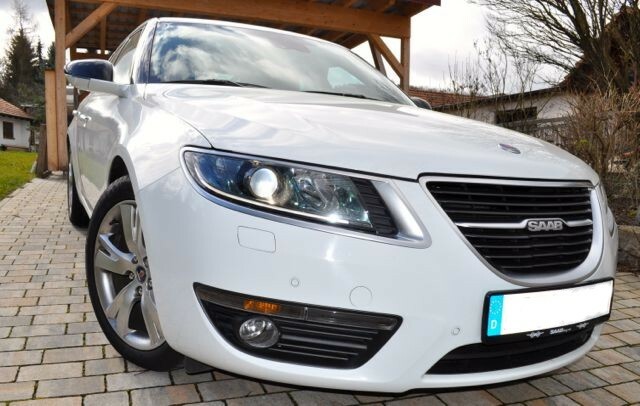 The Saab is good on the gas, responsive and sportier than the big brother with the V6. The agility is amazing, the 4 cylinder is inherently lighter, and the lack of four-wheel drive also brings weight savings. The first impression on board is positive. The workmanship is perfect, nothing rattles or creaks, everything sits as it should. No comparison with the first contact from the year 2010. The sports seats are as they should be with a Saab, you will immediately find the right seating position. It goes through the Elbtunnel and further in the direction of Hannover. The highways are still limited in speed, which changes soon. The 9-5 is a tremendously casual vehicle, especially with this engine. You glide comfortably, enjoy the relaxed seats and the Dolby Digital Sound; If you then step on the gas and demand performance, the Swede is immediately wide awake. And now he is allowed to perform, because the further south we go, the more free sections you will find. We run the Saab with 210, the winter tires do not allow more. He could be faster, the deer variant catches the 2 liter of Bio Power only at Tempo 250. The speed you take was not right, so quiet is the car. Only the Hirsch exhaust now announces presence and reminds us that we are traveling in a sporty vehicle. How well a suspension is tuned, you realize at the latest in the Kassel mountains. Fast, tight curves, nasty climbs. The Saab is like the proverbial board on the street. Long wheelbase, wide track and a low center of gravity result in unexpectedly good handling. The chassis of the 9-5 without Drive Sense was in the premiere 2010 in the criticism. Which was certainly justified, and the Swedes hurriedly and successfully repaired. In England, the motor press was invited to present the new vote and received much praise for it. Unfortunately, this action came too late. Also, the first press vehicles had an unfortunate setup and the call was, again, struck. It did not matter anymore that 2011 got better with model year, and soon Saab produced other, more tragic-spectacular headlines. Shortly before Kassel we have to refuel. Our ambitious pace has cost 17 liters of E85 per 100 kilometer, now we're filling up Super Plus. Since the highway is now almost deserted in the evening, we let the 9-5 fly further in the direction of Frankfurt. We will then stay below 14 liters, and I'm sure: with a slightly more economical driving style, we would have ended up with a consumption of under 10 liters. But do we want that, if ever the freeway gives the rare opportunity for free travel? And by the way: with refueling and lunch break we need 5 hours for 619 kilometers this Saturday with empty highways, are always relaxed and under the legality on the way. So much for the consumption values. From Kassel, friend Achim takes over the wheel. His first ride on a 9-5 NG. A few months ago, he bought an 9-3 TTID. A great car, which he does not want to trade. Until this weekend and until this ride in 9-5! In the meantime we are on the motorway Fulda in the direction of Hanau. Time to think about the Saab ... Would Saab have had a chance with the 9-5? In December, Mark and I were traveling with rental cars from Ingolstadt and Stuttgart in Germany. If we take off our Saab glasses, then the verdict is clear. The Swedes would have been on an equal footing with what they are building in Ingolstadt. Not really better, except perhaps in the long-distance fitness. Because there is the 9-5 hard to beat. And the suspension is better than anything I've experienced at Audi, even without the Drive Sense. For while the brand with the four rings relies on driving that is largely decoupled from the environment, Saab pursues a different, long-standing philosophy and gives clear feedback on the road surface and condition without being annoying or inharmonious. I like that, purely subjective, better. Whereby there is still a little history on the subject of the suspension tuning and the sporty handling. Shortly before production maturity, the 9-5 Aero XWD competed on the Opel test field in the Rodgau, near our Saab hangar, for a comparison test with the international premium competition and drove it to the ground. Driving dynamics, the 9-5 is at the front, what you would have expected of the 5 meter sedan really. In the Bavarian - Hessian border area Achim leaves me, and I drive the last few kilometers on curvy roads of third order alone towards Spessart. The Saab is good, the 9-5 is the most agile Saab of all time. It's really fun, and the cornering speeds on my home track are higher than normal. The well-tuned automatic contributes to the sporty driving. For the first time in a Saab she earns the name adaptive to 100% and supports with a sporty touch by skilful downshifting the driving pleasure. The high cornering speeds are an experience that I already made with the 9-5 NG sports car on the same street. At that time, I thought I saw the cause of the 5 Meter's handiness in Drive Sense, all-wheel drive and eLSD. All this does not have the BioPower. It's just a well-tuned, conventional suspension that lets the 9-5 fly around the corners. Saab had done his homework. Unfortunately only too late! 18 thoughts too "Review. Saab 9 5 NG BioPower." I occasionally work in the direction of Göttingen, so I know the "test area" Kasseler Berge quite well. With moderate-ambitious driving (130 - 140 km / h) had the 8 on the fuel gauge no chance, and also the 7 almost fell - after 400 km was the consumption indicator at 7,1 l. The 10 l / 100 km should certainly be realistic with your engine. One can only hope that Kai Johan also reads - so in the further development (in addition to the electric car technology), the "normal" PHOENIX technology is neglected in any case and then yet again a splendid specimen similar to the tested 9-5 sees the light of the world. Also like with additional hybrid variant! That SAAB has never made these benefits public - as well as the comparison test of the Swedish police with VW vehicles - can actually be described as a PR disaster. Generally speaking, SAAB has never been very present in vehicle advertising - at least as long as I follow it at least fairly. A mistake ... to build excellent cars alone has never been enough, after all, the car history is full of small but fine brands, which then disappeared from the market but lack of sales. Of course, the question remains to what extent GM had "reserved" the European market in-house for Opel. I remember very well the advertisement for the Audi A8 from 1996, when a man walked through the museum, and in the tricks many comments such as "Egypt, early modern times, glass" (exemplary), and in the end he came in one Garage with the new A8: "Germany, late 20. Century. Aluminum. "Is probably still around somewhere on YouTube. Background was probably the body made entirely of aluminum. And where we are already in advertising, the Quattro spot from 1986, the 2005 or 2006 has probably been reissued, is also legendary. In my imagination, he would be overtaken by a SAAB, but I think for 2 cars the ski jump width is not enough. I think our Swedish friends will have to think about whether they are doing their favor with their restraint. Clattering is now part of the craft, phrases pig or not. Pioneer of aluminum construction was the French company Panhard, which made the bodywork of the Dyna X and the successor model Dyna Z completely made of aluminum. Basis was, however, each a steel tube or subframe. For cost reasons, however, the aluminum content of the Dyna Z was always lower, but nothing changed the progressiveness of the car. Unfortunately, the fate of Panhard was similar to Saab (with GM): Gradual takeover by Citroen and then 1967 the final out. This is an article to my taste. Nice car and good route. Quiet sometimes unreasonable and chasing a few liters more through the engine. Yes, there are V6 XWD deer that are allowed to run free. So you can annoy then the toys from the southwest. Have fun with it! Call for help! I gave my XWD 6 a deer tuning and freshened up inside with the beautiful center console in carbon leather. Unfortunately, unfortunately I did not buy an exhaust system from Hirsch and now it has no more! Is there still a dealer out there who has an exhaust system for my Saab NG 9-5 XWD 6? The way is far and leads to northern Germany. Saab Kiel adapts the 4-cylinder Hirsch system to the V6. Uii, that would be really perverted! 15 km away from the Hirsch Garage take the way to Kiel to have a deer facility adapted there. I think I will ask directly in St. Gallen if they do that too! Thanks for the indirect tip. That would be really hard ... I keep my fingers crossed! I can only confirm the driving report, since 3 weeks I finally have a 9-5 Aero BP XWD. It is a pleasure to drive this car. Even my wife, who always shakes my head over my "Saabomanie", now always wants to drive with the 9-5! Hopefully there will someday be a successor who is just as much fun ... ..